Universal Coax Printer Interface with firmware resident bar codes and large characters. Emulates IBM 3287, 3268, 4214 and 3262. Support for continuous forms, paper drawers, envelope, auto page orientation, and COR (Computer Output Reduction). 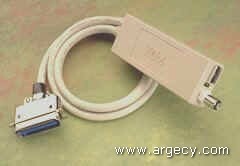 PR195E-PAR : direct parallel connection to your PC printer. PR195E-SER: direct serial connection to your PC printer.